From all the places I have seen around Ninh Binh Province, Hang Mua Peak, also called Mua Cave, is by far my favorite. I must admit that at first I was hesitant about whether or not to climb all those 500 stairs. They looked quite steep and I wasn’t sure if the climb was going to be worth it. However, I took a leap of faith and decided to give Hang Mua Peak a chance and it was the best decision. 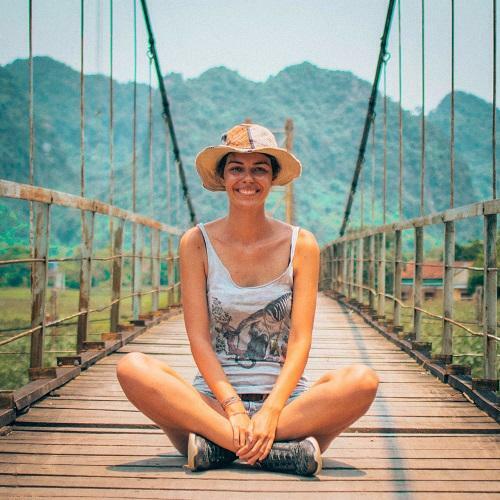 Since you will be in the Ninh Binh Province, you can easily link your visit to Hua Cave with other attractions in the area such as Thai Vi Temple or Bich Dong Pagoda. The area is full of beautiful sights and things to visit. There are actually two peaks on top of Hang Mua. To reach the higher one, you will have to climb for about 20-30 minutes and if the weather is hot and humid, it can be challenging but don’t give up. Close to the peak there is a small kiosk which sells drinks, sweets and ice cream. When you think you can’t climb anymore, think about that cold, delicious chocolate ice cream and keep going. The view from above is definitely one of the best views I have seen so far in S-E Asia. 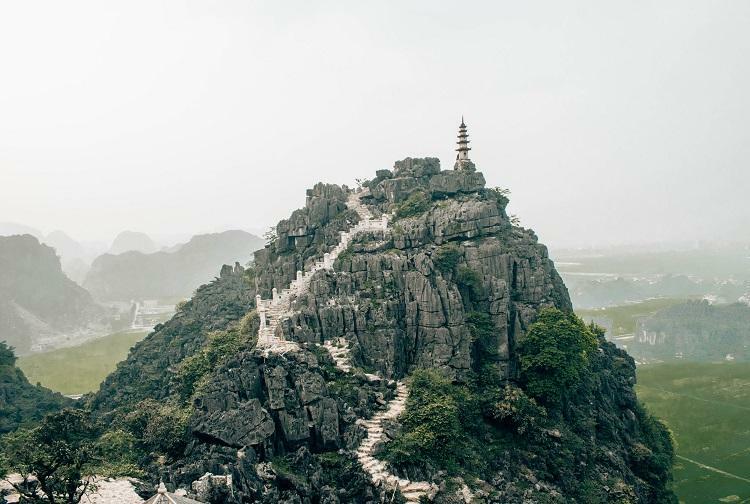 Once you reach the top, the panoramic view over the Tam Coc Valley and all the limestone mountains and rice fields is absolutely breathtaking. I loved staring and the mountains and their strange, round shape. If your legs are still working, you can also visit the second peak (we didn’t). I bet it also has amazing views and it is less crowded. Check out all the Ninh Binh must see attractions here! On the top of Hang Mua highest peak you will see a stone carved dragon watching over the valley. The dragon plays a very important role in the Vietnamese culture because the Vietnamese people are believed to be the descendants of a dragon and a fairy. To the local people, the dragon is essential for rain and agriculture and I believe that this is the reason why it watches over the entire Tam Coc area. The Mua Cave dragon is a symbol of prosperity here. Also, it is a good spot to rest and admire the views. Although Mua Cave closes at 5 pm and the sunset is at around 6.30 pm, you can still enjoy the sky starting to turn orange as the sun prepares to set. The Mua Cave Ecolodge is situated at the base of the mountain. To get to the stairs, you will have to firstly go through this oasis of lush plants and tranquility. The eco lodge also has a small lake which offers a spectacular view over the Hang Mua Peak. If you want to spend a few nights surrounded by peace and nature, you can book your stay here. Brink water with you. Trust me, you’ll need it. You can buy water at the base of Hang Mua or from the kiosk close to the top. Visit it either in the morning or in the evening when the sun is not very strong. Bring comfortable shoes with you. Climbing those stairs with flip-flops will be hard if not impossible. Mua Cave is situated at about 3 kilometers away from Tam Coc and 7 kilometers away from Ninh Binh. Depending on where your accommodation is, you can choose one of the options below. Whether you stay in Tam Coc or Ninh Binh, you can easily get to Hang Mua by motorbike. Renting a motorbike should cost around 150,000 VND per day, depending on you negotiation skills. You can rent one from your accommodation or from nearby hotels. Just remember to avoid the scam I have told you above. After visiting Hang Mua Peak, you can use the motorbike to also visit the nearby attractions: Thai Vi Temple or Bich Dong Pagoda. Getting to Mua Cave from Tam Coc by bicycle is definitely an easy ride. However, due to the traffic and longer distance, I would not recommend biking 7 kilometers from Ninh Binh. Renting a bicycle should cost between 50,000 – 100,000 VND per day. You can take taxis from both Tam Coc or Ninh Binh. Although it might be more convenient, remember that this is more expensive than the motorbike or bicycle if you are combining more attractions in one day. The taxi should cost around 15,000 VND per kilometer. The Hang Mua Peak is definitely worth climbing all those stairs. The view from the top will stick in your memory for a long time. Thank you very much for sharing this to people in the worlds about Ninh Binh in Vietnam. I loved Ninh Binh! Such a beautiful area!